When Nikon launched D90 last year, little did they realize how it would change the world of video-graphy. Nikon brought the professional quality of image capture to the world of video in a cost-effective manner. The powerful digital sensor of a DSLR was now employed to deliver the same quality of picture to the video. HDSLRs are truly revolutionary. Their large sensors capture light better than any prosumer camcorder. SLR lenses are sharper and more versatile than any video camera lens. HDSLRs produce clear, high-contrast, super-saturated footage with an undeniable silver screen feel. But they’re not perfect.﻿ Here’s a short article on the details of HDSLR re/evolution. 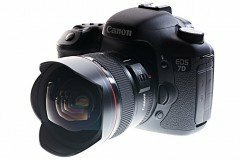 The HDSLRs can only be expected to get popular and even replace some mid-end HD video-recorders which also shoot mediocre still-photos. In fact the advancement in technology will ensure that there’s one equipment that delivers photographs and videos equally well while being cost-effective. Do you already own one?